When you get off the plane at the Las Vegas airport, you are surrounded by larger-than-life-sized pictures of all the local celebrities—Barry Manilow, Celine Dion and even Louie Anderson all smiling down to welcome you to town. After a recent trip, I would like to add Wayne Leroy of North Las Vegas, Nev., Lodge No. 2353 to this welcome committee. Assistant Director Debbie Kahler Doles and I had the opportunity to visit with Wayne, who is the Project Manager for his Lodge’s Impact Grant, the Veterans Outreach Project. 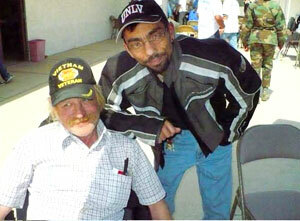 The Lodge uses its grant to help run the Las Vegas Veterans Stand Down, but that’s just the kick-off event. The Lodge continues its outreach to homeless veterans throughout the year, partnering with U.S. VETS and other groups to hold support events. Wayne marks this year-round support as the part of the project he is most proud of. As well he should be—the Stand Down reached out to 477 veterans last year, but the rest of the events reached more than 900 additional veterans throughout the year. Wayne proceeded to greet everyone at this facility by name, from the receptionist to the security guard to the social workers. At the adjacent outdoor patio used for some of the outreach events, we met Mike, who is the cook at the U.S. VETS facility. 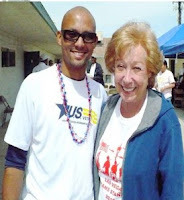 Mike also helps with all the Veterans Outreach Project’s events. We chatted for a while, and Mike promised he was ready to cook for the upcoming Stand Down. We also met with the director of the facility, Shalimar Cabrera. Shalimar showed us around the facility, and we talked of Stand Down preparations. We ended the trip with a drive past the new VA hospital in Las Vegas. The sprawling new building is under construction, and Wayne is a member of the building advisory committee. Wayne is also an Elks VAVS representative. Wayne, in my eyes, is a true Las Vegas superstar. Now can we get to work on that airport poster already? The ENF awards Impact Grants to help Lodges significantly address unmet needs in Elks communities. Impact Grants are competitive grants worth up to $10,000 and are open to all Lodges. Click here for more details on the Community Investments Program. 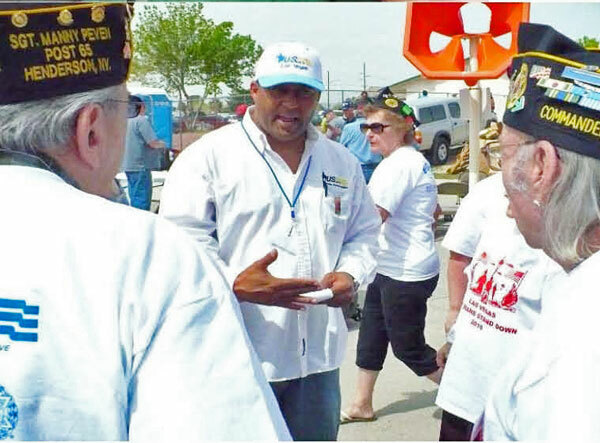 He has done a lot for the North Las Vegas veteran's community. Wayne needs to be recognized for his efforts. Wayne has given so much to the community. There truly are many outstanding people in Las Vegas. I've met many Las Vegas divorce lawyers I kept in contact with through the years.